Jeff Kenney did a nice article on Becky that appeared in last week’s Culver Citizen and yesterday’s Pilot News. She has sent cards out to residents in the area to let people know where she is. Hopefully this article with help with that as well. For those of you trying to find her, she’s taking appointments at (574) 935-HEAR(4327). Grant Munroe is working on a website for her at bergeraudiology.com, but that’s not up and running yet. Thanks to all of you that have been supportive of her in this endeavor. Hopefully you can enlarge the article above enough to read it, but it not, let me know and I’ll send you a copy. This is my Musical Recommendation for the week. Duke Tumatoe & The Power Trio will be appearing Friday Night at River Park Square. 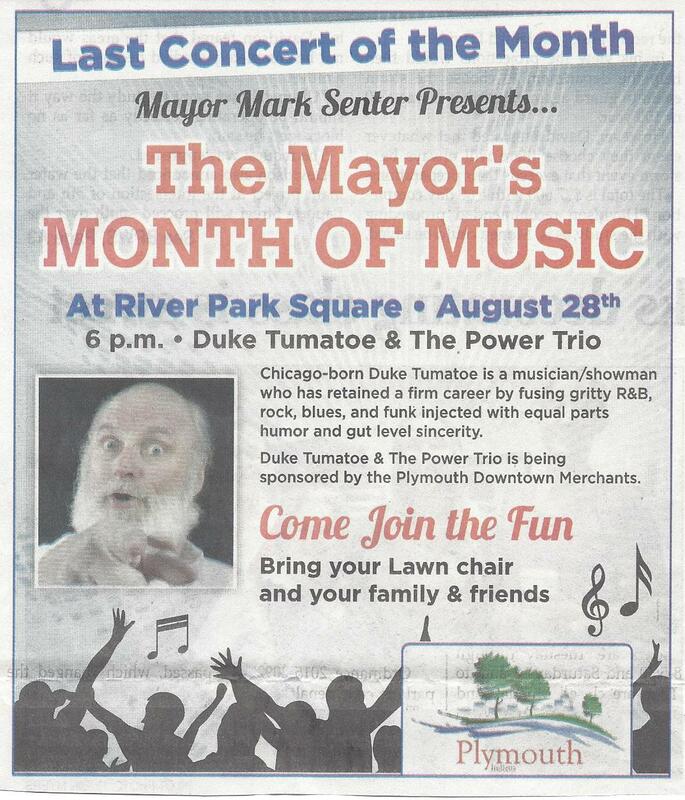 This is part of The Mayor’s Month of Music. Becky and I just recently went to see him in Monticello on the Madam Carroll. The music was good and the presentation was entertaining. You won’t be disappointed if you check out this free concert. Last year I wrote a post (here) on QWERTY keyboards and why I thought we were taking a step back with two finger tying on iPads and their ilk. For anyone intrigued by the birth and widespread adoption of the QWERTY keyboard, I ran across an in depth article at discovermagazine.com called “The Curse of QWERTY” that you can read here. I need to start watching for Jeff Kenney’s Throw Back Thursday entries. I never know when one of our past projects will show up. 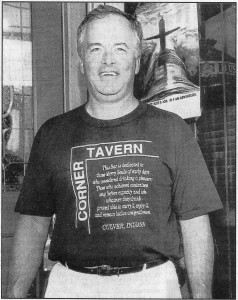 Last week’s entry featured the expansion of the Corner Tavern back in 1995. Will Pearson owned the Corner Tavern then and since his wife Kathy worked here in the office, it was natural that he came to Easterday Construction Co., Inc. to do the work. This was also another collaboration with Don Scearce of Scearce & Associates, now SRKM Architecture. The expansion provided additional seating, better natural light and improved access to the basement. It also improved the kitchen and restrooms bringing them up to code. There were plans to expand into the upstairs, but there were various code issues that prevented that at the time. The restaurant later sold to George Pesek and went through another renovation to become the Corndance Cafe’, its current incarnation. It remains a fixture in Culver and continues to be a source of pride and income to Culver residents. 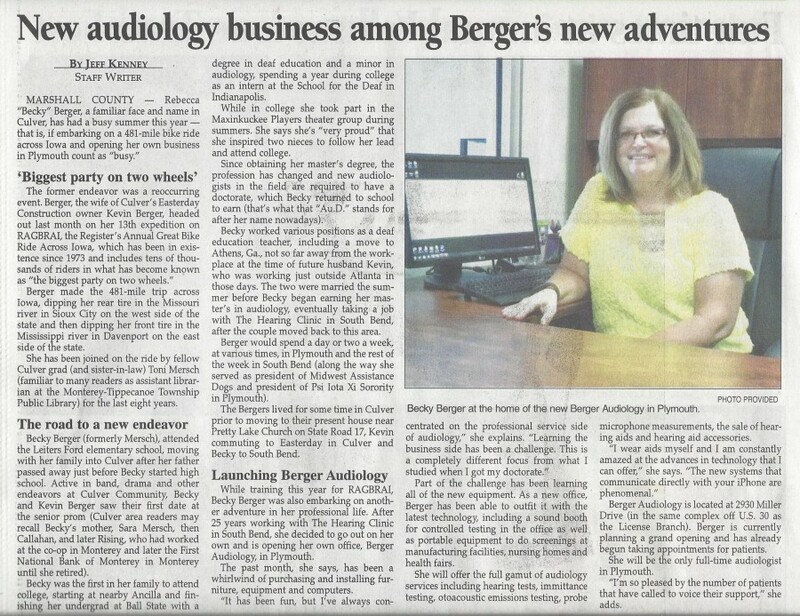 Berger Audiology – First Patient Today! Becky saw her first patient today! Her schedule is starting to fill up next week. She’s excited! She’s still struggling with some of the office management software, but she should have that under control soon. She’s gotten all her audiology equipment installed and has most of the support materials in place. Monday she has a fairly full day of patients. 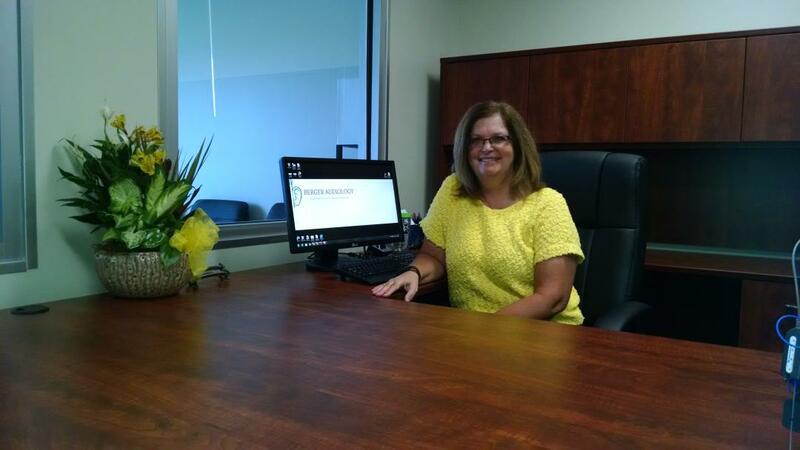 She’s looking forward to getting back in touch with the clients she has worked for over the past two decades.